"Muy profesional rápido y bien empaquetado, gracias"
Silver pendant with semiprecious stone trillant model. Pendant made in sterling silver available to buy in several semiprecious stones. It is a very original pendant model composed of a semiprecious stone trillant shape suspended in a silver arch. The trillant silver pendant measures about 28 mm x 20 mm with the ring. 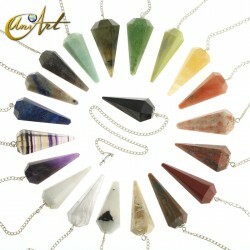 The options are: Smoky quartz, rose quartz, moonstone, ruby, amethyst and malachite.